GAROWE ONLINE EDITORIAL| The good doctor had ruined the institutions built by previous governments since the founding of Puntland State of Somalia in 1998. The government he inherited from President Farole was known as the government of strong institutions and independent-minded valuable ministers who had created ministeries that were meeting their mandate with cooperation and collaboration. 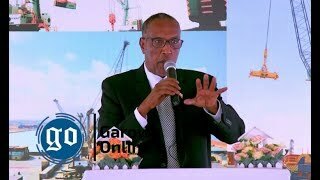 When president Abdiweli Mohamed Ali Gaas assumed the presidency of Puntland on Jan 8, 2014, there was jubilation that Puntland was destined for better tomorrow. Contrary to people's expectations the former president Gaas will be remembered as the professor who found a treasure and ruined that jewel empty. His expertise and economics background and claiming to be a (Ph.D.) holder has never benefited the people, the region or the land, many hoped to learn from a president with so much education but that hope was inflated. His government was a one-man show government as he made himself the center of gravity, never leading his ministries, he instead created individual ministries in the Presidential Palace that became a cash cow for him, hindering the work of the ministries of the government. He encouraged graft in the ministeries where the corruption trickled down to the young staff in various capacities who have inherited from the bankrupt leadership of Gaas's government the only way to survive to steal, get bribes and kickbacks. 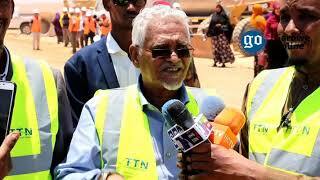 The good doctor will be remembered for making life hard for the average person in Puntland so their struggle became one of daily survival due to hyperinflation sparked fake currency he printed. His government will be remembered for being so far removed from reality. He busied himself with buying and corrupting public funds and turned blind eye to the worsening security and growing terrorist attacks. His leading a lazy government and disconnected from the average people. His ministers were used to bash the federal government instead of finding a lasting solution for the ongoing spat between regional governments and the federal government. He made history by attempting a comeback by running again in the presidential election of 2018 and he didn't even make it to the second round only obtaining 8 votes. Gaas will be remembered for the famous war on the 4.5 system, he pocketed seven million USD to sell Puntland to the federal government of Somalia in Mogadishu. He will be remembered for building houses and buying land, investing in multi-million dollar business in Zambia, Kenya, Tanzania, and the USA while poor Puntlander survives on one dollar a day. 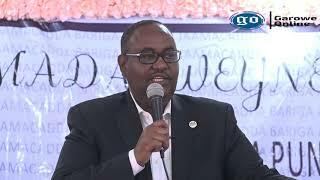 And so the former president of Puntland has won Garowe Online person of the year, for taking Puntland back another 5 years and for leaving a government in shambles. 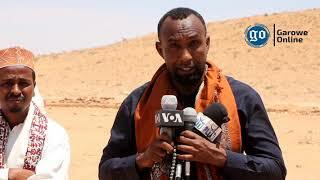 Dr. Said Abdullahi Deni, the newly elected president of Puntland will inherit a government that is ruined, with weak governance and destroyed systems. But Dr. Deni will come to a country who will rejoice a president that leads the people and shows the good governance is possible. The people of Puntland have survived Gaas and they are resilient people, creative and good people who have preserved for 5 years. They deserve a great leader who will build a good strong government with strong institutions, transparency, integrity, that respects the rule of law and justice for all. Our advice to the new president is please be a man of honesty, a leader who leads through example and a leader of the people and by the people. Gaas delayed the one person one vote for his own personal reelection to try and come back in 2019. Abdiweli Gaas will definitely be remembered as the president who severely killed any chances for women parliamentarians. He failed to preserve women's representation in Parliament, that is the reason the current assembly is 66-1 female. 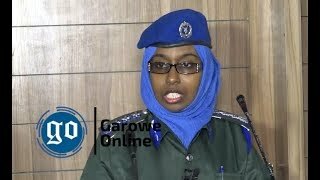 GAROWE ONLINE EDITORIAL BOARD chose the former Puntland President, Abdiweli Mohamed Ali Gaas Person of the year, for taking Puntland back another 5 years and for leaving a government in shambles. We awarded him a wooden spoon. !